Donald Trump has a way about him that makes people go crazy. Take your pick of how he makes people go crazy. Either he’s leading huge rallies of people or he’s driving people to destroy their cell phones and smash up public monuments. There seems to be no difference. 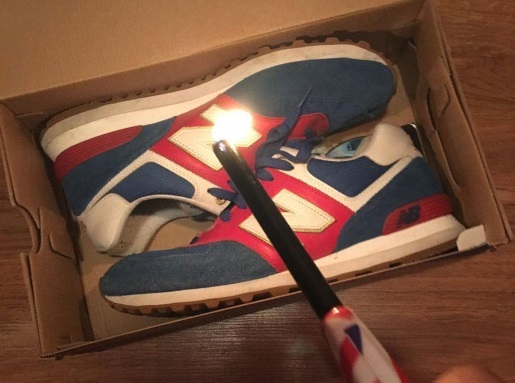 Now, because of a statement that’s been misinterpreted as pro-Trump by people online, New Balance shoes are being burned in protest on one hand and praised as “the official shoe of white people” on the other hand. It’s actually pretty remarkable. During the various campaigns, Donald Trump, Hillary Clinton, and Bernie Sanders spoke out against TPP, the Trans-Pacific Partnership trade deal that would function as a trans-oceanic NAFTA agreement. New Balance, the only company that makes athletic shoes in the United States, has been protesting this deal to the Obama administration to no avail, because it would make US-based shoe manufacturing a thing of the past due to cost issues. After saying that Trump was a move in the right direction, the company is now backing off that statement and scrambling to explain while people Tweet pictures of burnt shoes. Meanwhile, white supremacist alt-right website The Stormer published an article by Andrew Anglin declaring New Balance to be the new ‘official shoe of white people’ thanks to the company’s pro-Trump statement (if you can call protesting a trade agreement as pro-Trump. New Balance, for their part, has vehemently denied any pro-Trump or pro-white supremacy views. They’re just a company trying to make shoes in Boston.